To those who voted for Obama and those who had doubts about the direction he is taking America to, the events in Egypt showed shed some light to it. Muslim Brother hood has been outlawed in Egypt by Mubarak for sometime now. So, they decided to forgo so called “violence” in Egypt. They did not have much clout politically, but they did to certain extent have a presence among the population. The current events in Egypt did not give them much platform until the American president gave them the platform they dreamed of. Obama’s policy toward Islam and its jihadists groups seems to be consistent to his ideal world with Islam is a prominent world force that would shape up the globe and people must accept it because Obama think it is a good thing. “Allah is our objective. The Prophet is our leader. The Qur’an is our law. Jihad is our way. The Brotherhood’s goal is to turn the world into an Islamist empire. 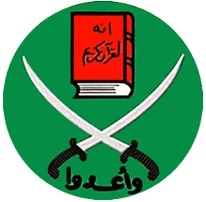 The Muslim Brotherhood, founded in Egypt in 1928, is a revolutionary fundamentalist movement to restore the caliphate and strict shariah (Islamist) law in Muslim lands and, ultimately, the world. Today, it has chapters in 80 countries. The Brotherhood assassinated Anwar Sadat in 1981 for making peace with the hated “Zionist entity.”It also assassinated Egypt’s prime minister in 1948 and attempted to assassinate President Nasser in 1954. Hamas is a “wing of the Muslim Brotherhood,” according to the Hamas Charter, Chapter 2. The Charter calls for the murder of Jews, the “obliteration” of Israel and its replacement with an Islamist theocracy. The Brotherhood supports Hezbollah’s war against the Jews. Brotherhood leader Mahdi Akef declared he was “prepared to send 10,000 jihad fighters immediately to fight at the side of Hezbollah” during Hezbollah’s war against Israel in 2006. The Brotherhood advocates violent jihad: The “change that the [Muslim] nation seeks can only be attained through jihad and sacrifice and by raising a jihadi generation that pursues death just as the enemies pursue life,” said Muslim Brotherhood Supreme Guide Muhammed Badi in a September 2010 sermon. Major terrorists came out of the Muslim Brotherhood, including bin Laden’s deputy Ayman al-Zawahiri and Khalid Sheikh Mohammed (mastermind of the 9/11 attacks).